Tromboncino Squash (Cucurbita moschata ‘Tromboncino’) seeds. 鵝形瓜的種子. Tromboncino Squash (Cucurbita moschata ‘Tromboncino’) 10 days old seedlings. 鵝形瓜10天大的小苗. Tromboncino Squash (Cucurbita moschata ‘Tromboncino’) plant has large leaves. 鵝形瓜的植株葉片頗大. Tromboncino Squash (Cucurbita moschata ‘Tromboncino’) male flower is forming! 鵝形瓜的雄花形成中! Tromboncino Squash (Cucurbita moschata ‘Tromboncino’) female flower is forming! 鵝形瓜的雌花形成了! Tromboncino Squash (Cucurbita moschata ‘Tromboncino’) each fruit is about 2′ long so far. 鵝形瓜每條瓜目前約有2呎長. Tromboncino Squash (Cucurbita moschata ‘Tromboncino’) on the structure. 棚架上的鵝形瓜. Tromboncino Squash (Cucurbita moschata ‘Tromboncino’) first harvest fruit! It weighs 13 lb! 鵝形瓜第一個果實採收了! 經秤重有13磅重! Tromboncino Squash (Cucurbita moschata ‘Tromboncino’) 鵝形瓜 Harvest them a bit over a foot long, very tender, taste like zucchini. 超過1呎就採收,瓜很嫩好吃,嫩時較接近夏南瓜,較熟較大時採較像不甜的南瓜. 80 days. Annual climber, summer squash. Easy to grow. Best growing in full sun location. Fruit shape like trombon or goose like shape. Mature size:5′(H/W). Propagate by seeds. Fast growing vine. 約80天成熟. 一種一年生蔓藤類的夏南瓜. 容易栽種. 最好栽種在全日照處. 瓜形如長型喇叭或是鵝型. 成熟株高/寬幅:5呎. 繁殖以種子的方式來進行. 生長快速的藤類. Tropical perennial climber. Easy to grow and propagate. Best growing in partial shade to light shade location in moist soil. Fragrant pink flowers in clusters in summer. USDA Zones:9-11. Mature size:12′-15′(H/L) X 1′-2′(W). Propagate by seeds, cuttings, layering or division. Suitable for growing in the container indoors. 熱帶多年生爬藤. 容易栽種及繁殖. 最好栽種在半日照到散光處的溫暖濕潤的環境. 夏開粉色成簇芳香的小花. 喜熱不耐寒. 成熟株高/藤長12-15呎,寬幅1-2呎. 繁殖方式以種子,扦插,壓條或分株的方式來進行. 適合室內盆植. 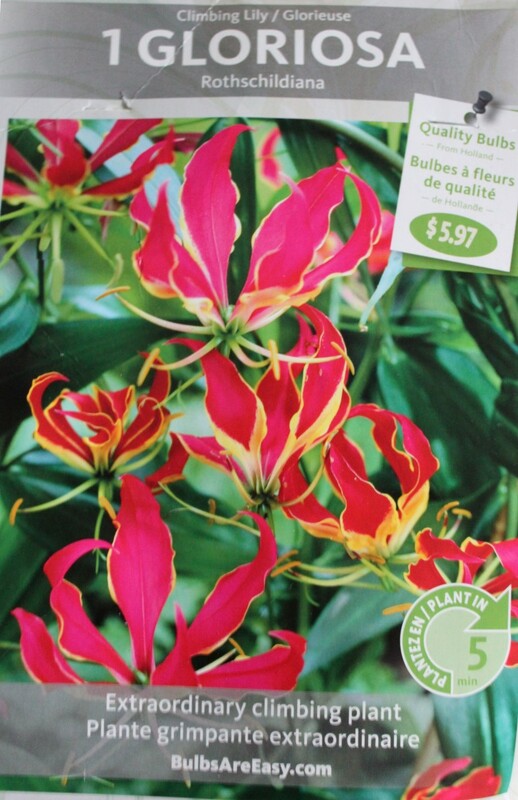 Glory Lily (Gloriosa superba) bulb pack. 嘉蘭球根包. 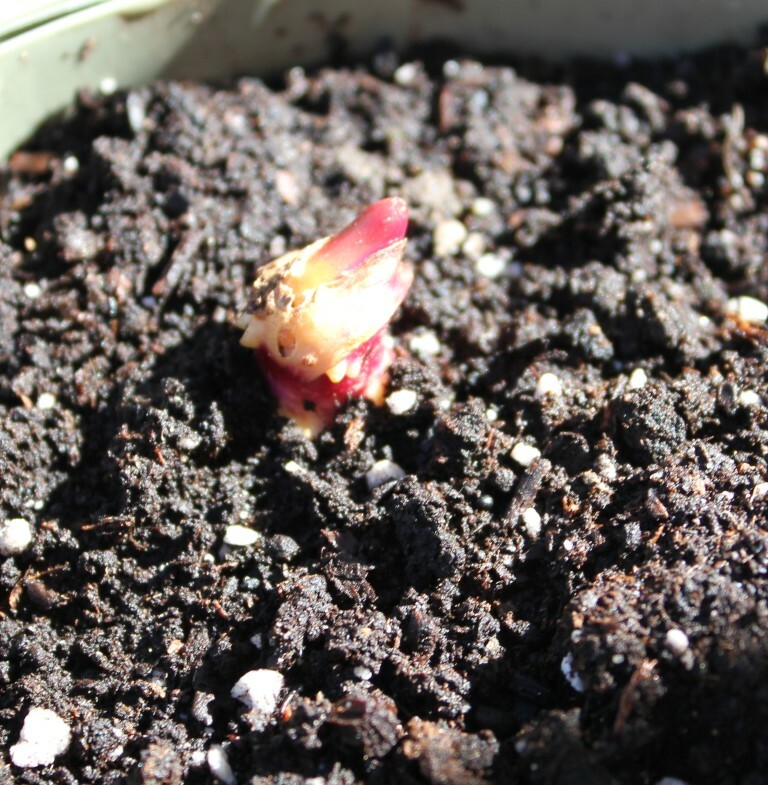 Glory Lily (Gloriosa superba) is starting to grow! 嘉蘭開始生長了! Glory Lily (Gloriosa superba) seeds germination in about 30-45 days.嘉蘭的種子約30-45天孵出. Glory lily (Gloriosa superba) seeds. 嘉蘭的種子. Glory Lily (Gloriosa superba) seeds germination easily. 嘉蘭種子蠻容易孵出的. Glory Lily (Gloriosa superba) seeds growing the true leaves. 嘉蘭種子長出本葉了. Glory Lily (Gloriosa superba) flower in day 1, top view. 嘉蘭開花的第一天,花頂角度拍的. It also is called flame lily, climbing lily, creeping lily, gloriosa lily, tiger claw, and fire lily. Unique flowers. It is native to Africa and Asia, it is well-known worldwide as an ornamental plant, a medicine, a poison, and a noxious weed (in Australia). It has fleshy long rhizome. Orange-red flowers in late spring to early fall. Nice long blooming time and flowers attract butterflies and humming birds. USDA Zones:8-11. Mature size:6′-8′(H)X3′-4′(W). It is a nice climber. If you live in cold climate just lift the rhizome and store somewhere indoors like in the basement. 百合科嘉蘭屬,全株有毒. 花形美而奇特,可以用種子或扦插枝條來繁殖. 花期很長,春末開到初秋. 花吸引蜂蝶及蜂鳥. 成熟株高6-8呎,寬幅3-4呎. 容易栽種也容易以種子或扦插方式來繁殖. 它耐熱不耐寒. 若種在溫帶地區,根需起出貯存在室內如地下室之類的地方渡過冬天. I planted spinach and pak choi seeds in this planter. 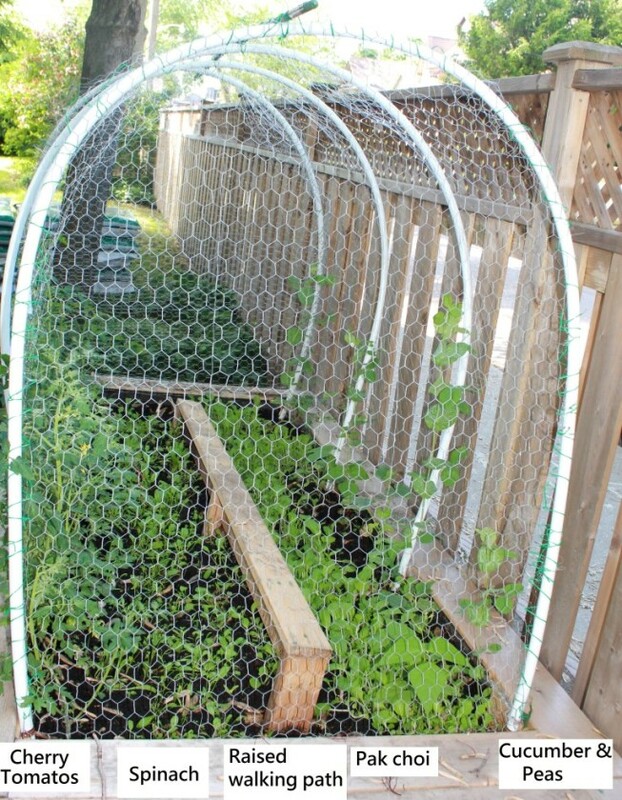 On both sides are cherry tomatoes and climbing cucumbers and peas. Cherry tomatoes are flowering and fruiting along with peas and cucumbers! I grew these seedlings from seeds in early spring. There are couple of wax beans inside as well to experiment this year. 初春播種種子成長的小苗和種子直播種植出的. 由左而右為小蕃茄,菠菜,小白菜,大黃瓜和豌豆. The other planter is for slow growing veggies. 另一箱種的是較長生長期的蔬菜.